In our Vegetables, Grains, and Starches class in culinary school, Ratatouille was one of the dishes that we made. When I told friends and family about what we made that night, I realized that very few of them had actually tried it, which surprised me…but they’d heard of the name before because of the movie. And honestly, that was also the only reason I’d heard of that name as well. After that class though, seeing how simple and incredibly healthy this dish was inspired me to make it at home. My husband told me that he wanted to start eating healthier, so I decided to start looking into some quinoa recipes. Quinoa is a high protein seed that is gluten free and is actually one of the highly recommended super foods to eat. Before this dish, I had only tried one bite of it when my friend was putting together really healthy recipes, and she ate it a good bit. It reminds me of rice…smaller in texture, but somewhat of a bland flavor that could easily be accented with natural spices, but fluffy like rice. While at the health food store the other week nosing through the aisles, I came across quinoa and picked up a bag to make something at home…just wasn’t sure what yet. After looking through a quinoa recipe book, I saw this recipe and thought, Hey, I’ve made ratatouille at school, so I can easily make this at home! Done. I did change a few things around with this recipe to mimic the original ratatouille recipe that I made at school, and this was delicious. My husband even asked if there was any meat in this dish since I was making it for lunch, but told him that quinoa is very high in protein. He shrugged and agreed to give it a shot. Two helpings later, he told me that he really liked how the flavors of the veggies all went together. This could also be a really great Vegan dish, just remove the cheese or replace it with soy cheese. Preheat oven to 375 degrees. Cook quinoa according to package directions. Heat olive oil in large nonstick skillet over medium heat, add onion and garlic. Saute for 5 minutes, or until softened. Stir in the diced tomatoes, basil, oregano, thyme, salt, and pepper. Continue to cook for 1-2 minutes, then remove from heat. Place remaining chopped vegetables in bottom of 9×13 inch baking dish. Spoon onion and tomato mixture on top of vegetables. 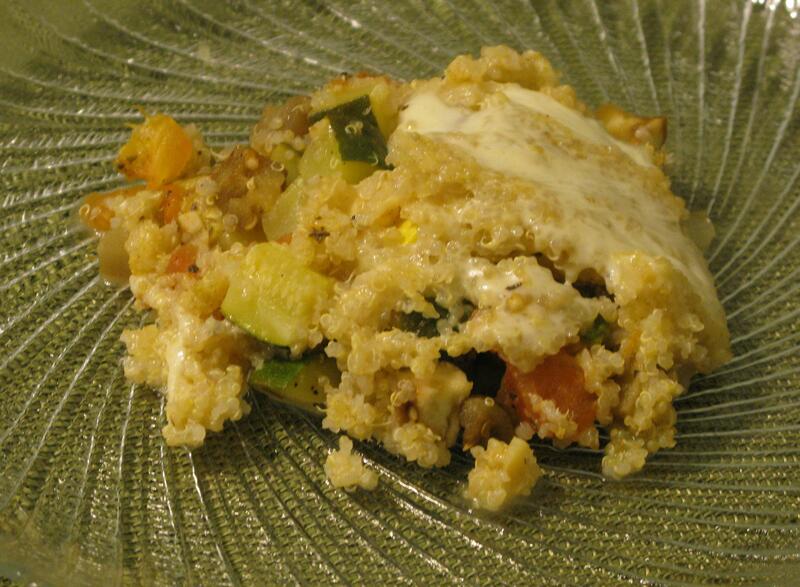 Sprinkle with parmesan cheese, spread quinoa on top, then sprinkle mozzarella on top. Cover with foil, and bake for 40-45 minutes. Remove foil and continue baking for another 5 minutes. **I actually made this with fresh tomatoes instead of canned. To do this, cut an X in the bottom of two large tomatoes and place in boiling water for 20-30 seconds. This loosens the skin from the tomatoes, making it easy to peel off. Place the tomatoes in ice water to cool, then peel the skin off the tomatoes. Slice horizontally, then scoop out as many of the seeds as you can get. Chop them up, and there’s your tomato mixture to add to the garlic and onions cooking in the olive oil. Can’t beat fresh veggies!